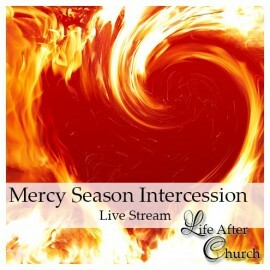 Intercession has changed from the Ruler Season to the Mercy Season. This video explores the relationship between power and intimacy in the Mercy Season. Intercession is a widely embraced practice which was defined in the late 80’s in the Ruler Season. The objective was almost entirely accessing power. We warred in a broken world to produce change. The objective of intercession is still to produce change. Intercession is specifically defined as praying God’s will into reality. However, in the Mercy season there is a second objective and that is for us to grow in intimacy. Arthur explores the design differences among the Prophet, Giver and Mercy gifts, to illustrate how each gift can intercede, seeking to produce change, while experiencing intimacy in three different ways. The bottom line is that in the Mercy season we move to intimacy first and then out of this place of intimacy, power comes. During the Holy Communion we focused on the failure of the apostles in the Garden of Gethsemane and the fact that it did not produce a breach of intimacy on Jesus’ side of the relationship. In the midst of a thorny situation where the usual prayer points didn't seem to be touching the war at all, I felt the nudge of the Holy Spirit to listen to this teaching. God gave fresh insights on the next steps to take, and how to continue to tackle the battle in front of me. Thank you Arthur for once again unmasking a false paradigm and the misunderstanding of the true Mercy gift. It was really freeing and validating to hear your perspective and the validation of the ‘ugly’/‘angry’ Mercy in the context of the Church in Laodicea. As I’ve been walking the long road of ‘working to become more authentic in relationships’ (still on the journey of course! ), it’s been a very rude awakening that the least acceptance I’ve had has been from my Christian friends - several saying: ‘we like you when you are “nice” … anger doesn’t suit you - it's not the you we know/love'. Well, quite - ‘cause apparently that was the “Barbie-who-do-you-want-me-to-be-today-Version-of-Me“ not the REAL me!!! I accept my responsibility in presenting this version - but the shock has been that when I decided to 'let her go' and tried explaining my journey to my close Christian friends ... the empathy (let alone validation) has been very slow to come, and in some cases has never come. One of the fruits of embracing this transition has been that I feel like, for the first time in my life, that I am being connected back together and getting an understanding of the 'whole me' - rather than individual parts. Your commitment to address and speak honestly about Mercies has really enabled me to understand these issues from a Christian perspective (e.g. unsurprisingly, I've had lots of support from non-Christians during the transition - ...). Thank you again, Arthur. Very happy to dialogue/be connected with other Mercies going through a similar transition. The world desperately needs Mercy-Living-In-Reality reconciliation. The live stream tonight was really powerful! Felt a strong flow of life coming through Arthur and his level of passion was invigorating. There was a freshness and newness to the message that was inspiring. Many of the topics discussed are related to many things that I have been experiencing in this season, but I had no clarity or understanding on why things had shifted. This teaching gave language to subjects I have been sensing in my spirit for a few months, and brought focus and clarity for how to move forward in this season. The way Arthur brought very clear understanding to what true intercession looks like was immensely helpful and enlightening. Loved the thespian demonstration of the story of the widow and the rent house! Nice work! In addition, the communion portion was truly full of impact and the reading of John 17 was deep. Also, the new video and live stream setup was lovely! Such a clear video, much better lighting and color, more vibrant, and a great way to get up close and personal with Arthur and see his expressions more clearly. A wonderful improvement! Great job guys! Thanks for yet another excellent portrayal of truth! I so appreciated the crystal clear picture and explanation of true intercession. So vital to not only know the difference between prayer and intercession, but a precise painting of what intercession is. But on top of that, I soaked up the extension into intercession by design. I’ve never thought about Redemptive Gift design as it relates to intercession, but now see how it fits so perfectly for this Mercy Season – the alignment by God, then we move toward intimacy not solutions, and then according to our own situation, journey, and design – in that place of intimacy, the power comes. Clear, powerful path to follow, and really in a way quite freeing. This spurs me to dig into my own design in this context – It makes a difference. The section on Mercy’s was deeply touching, things I need to consider seriously to implement for impact. Sobering, but hopeful and freeing. The Scripture reading was once again penetrating, and the communion was like a mini journey into Love… not quite painful but something like it, yet a flavor of Beautiful. And at the end of it I found myself in some sort of sweet abandon… with a “To Be Continued” stamp from the Spirit. Power and intimacy are usually kept far apart in our culture. Heaven's culture is massively different. From the place of intimacy, we can hear God’s heart for the world. Then we can intercede with accuracy, since we already know His will.